USDCAD pops on dovish BoC statement today. 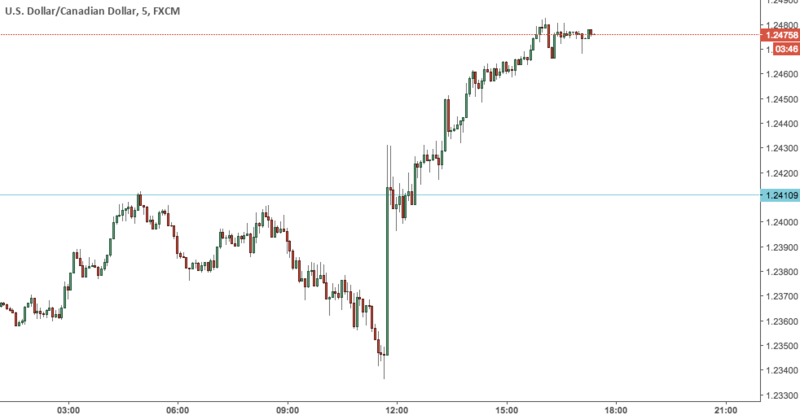 To say that today’s speech by BoC governer Poloz was bearish wouldn’t do the market reaction justice. The USDCAD, which has been ripping to the downside recently on a hawkish Bank of Canada and rising oil, reversed hard today on the revelation that the BoC is now going to move ahead with caution. A. Check you market calendar everyday and know when “red” news events are scheduled. B. Use a stop loss, even if it’s just an emergency stop. C. If you take a position leading into news, or have one that will be effected by it, run through possible scenario’s and plan ahead. Although we are used to Central Banks telegraphing their statements and intentions, in day’s gone by it wasn’t so easy. Move’s like today’s in the CAD were common, and who know’s, they could well be that way in the future. “In a speech to a St John’s audience, the BoC head highlighted that he’s aiming to proceed “cautiously” with more hikes, despite what’s been more aggressive pricing from the market and what was perceived as a hawkish September statement. That’s because household debt levels “amplify” the impact of the tightening he’s already introduced, while the strengthening C$ “complicates” the inflation outlook. …All told, the majority of the speech confirms our assumptions that tightening from the Bank of Canada will be a gradual affair from here, with our estimate being that the next move will have a 2018 time stamp. Bearish for the C$ which we see weakening by a few more cents by the end of this year, and bullish for the front end of the Canadian curve,” CIBC argues.